Midterm report: What in the world is happening in CIS women's hockey? We're at the halfway mark for CIS women's hockey, and if the season were to end right now, I couldn't tell you who would be the now eight teams — thanks to a revisit of the structure — heading to the national championship. 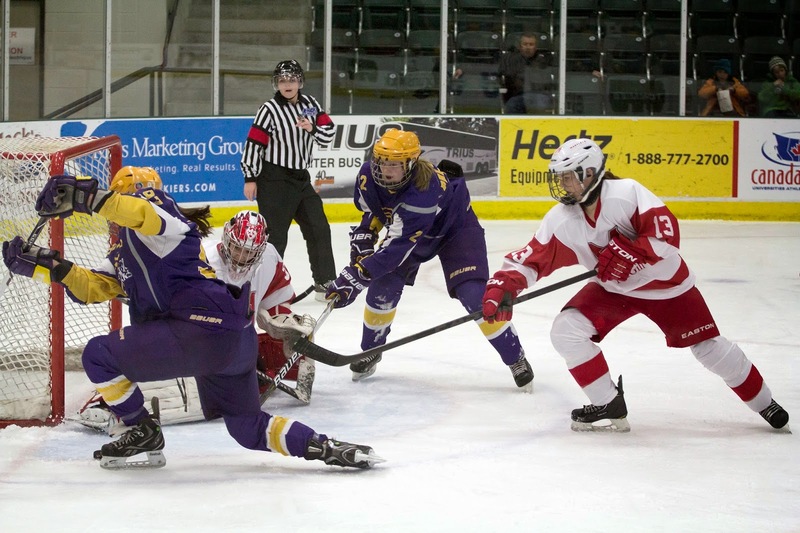 Last year, the McGill Marlets, Montreal Carabins, the Saskatchewan Huskies, the Wilfrid Laurier Golden Hawks, the Moncton Aigles Bleues and the St. Thomas Tommies made up the national bracket, which, for the most part, made sense. Montreal and McGill fought in one of the best gold medal games that went to two overtime periods before McGill buried the winner. Saskatchewan foiled Laurier's plans for bronze, essentially silencing the Hawks and taking home a medal for the first time in their program's history. The only thing that wasn't shocking was that the host St. Thomas went 0-3 in the tourney despite having one of the best fan bases I've ever seen. But right now, if we were to see who would go to the national championship, I wouldn't be able to tell you. Aside from RSEQ, where McGill and Montreal continue to run the show, every other conference is jumbled and full of unexpected and questionable records. Add that to the new format of eight teams going to the national championship, and we have a load of potential for teams. Let's take a look. The stigma with teams that come from the AUS is that they are the worst of the pack. Coming from one who sat in the beautiful press box at the arena in St. Thomas and watched part of the Tommies' opening game against Saskatchewan (they lost 3-2), the fact of the matter is they aren't as weak as people perceive them to be. Moncton — the winners of the AUS — had more trouble sticking with teams than St. Thomas did, and both teams really lost by a lack of speed rather than a lack of skill. But currently, St. FX sits atop the AUS with comfort of an 13-1 record while Moncton trails with a 10-3-1 record. St. FX's only loss? To UPEI, a team that has a 4-7-1 record and sits second-last in the six-team conference. St. FX could very well be the team that comes out this year from the AUS — they were supposed to last year, but the Mount Allison Mounties came out of nowhere to send St. FX packing. If they can keep composed and focus on their physical game — speed, strength and endurance — St. FX could compete on the national level, and should be a team we see at the national championship in Calgary in March. I went to look at the standings for the West, and literally was shocked by how close it was. Currently, six teams sit less than seven points apart. Saskatchewan sits at the top with 32, but closely behind is Calgary followed by Manitoba, Alberta, UBC and Regina. Really, the only teams out of that race are Lethbridge and Mount Royal. Calgary already has their ticket punched to the national championship as the host team, which could be a factor in not dominating the West like they usually do — or it could be the lackluster season of a certain women's hockey icon. What's also interesting to note is that many of the games those five top teams have played have gone to overtime — Saskatchewan has played five, losing two. Regina has played in an astounding seven overtime games, only losing one. This conference is so close that any slip-up once the playoffs begin can send anyone home — and I don't have a prediction on what's going to happen. It'll be the most interesting one to watch to see who will claim that provincial banner. This might be the easiest one to figure out mainly because thanks to McGill's victory last year, the RSEQ will most likely get the second assigned berth this year into the championship. And in reality, who else can compete with the big, bad McGill and Montreal? The conference standings seat Montreal and McGill respectively on the top, with Concordia six points back from first and an under .500 record. This is the easiest one to pick for me because there is no competition — McGill proved they are a powerhouse with speed, skill and national talent, and Montreal is right there with them. What the hell is going on in the OUA? I left the Ontario conference last for a number of reasons. 1) I have spent the last three years, three months and 13 days covering this conference, especially in women's hockey, to the bare bones of its structure. 2) The conference has the most teams, making it harder to analyze and really get a feel for how the playoffs will play out. 3) I'm slightly biased toward the conference. But most importantly, 4) I actually don't know where to start. At the beginning of the season, I knew from covering the Laurier Golden Hawks that they would have a target on their back. They're the defending OUA champions with a glowing resume. They came fourth in the country last year. But the loss of Candice Styles, one of the top converted defencemen in the country and speedster Devon Skeats, a very young team and no real good depth have been hindrances on their year. They sit at .500 and were pushed out of the Top 10 ranking for the first time since at least the 2003 season — which is when CIS records of women's hockey begin, according to Michel Belanger. So now, the OUA looks like a cluster of teams that make no sense with a bunch of questionable records, making deciphering true contenders from lucky teams pretty hard. Let's start with who's currently at the top — the Western Mustangs are the only team in the entire country that has not lost a game in regulation. They are good. They are a powerhouse and have a solid group from their leading scorer to their fourth-line defencemen. Western deserves to be running circles around the rest of the OUA because they are taking advantage of the convoluted conference. As long as nothing goes awry with injuries or sudden flattening in the second half of the season, Western is my pick to come out of the OUA. After that, everyone's everywhere. Who would have expected the Windsor Lancers to be third in the province? Queen's lost their fifth-year goaltender Mel Dodd-Moher, yet their third-year starter looks like a true veteran between the pipes — and it's showing. Guelph still sits among the top calibre, but the most surprising is the Toronto Varsity Blues, who are currently just above the Hawks in fifth. Toronto was feisty in the playoffs last year against Laurier, forcing them to a game three situation in the semifinals. However, what is important to note is that their goaltender, Nicole Kesteris, is headed for the Winter Universiade in February and this could be a big factor in how Toronto fairs in the final weeks. Granted, many of the best players from across the country will also be joining her. With those big players gone in the final weeks, it's going to come down to the depth of benches and the strength of players to vault them into the playoffs. From there, as we've seen, anything can happen. But I would not be surprised if we see Western and Queen's in the OUA final. Midterm analysis is hard because there are so many factors, but from what I've seen across the country — aside from RSEQ — it's going to be an interesting ending to the year. 1 additional assigned berth: If the berth goes to RSEQ like it should, it'll no doubt be McGill, and they'll benefit. They compete better on a national level than provincial, and there is no other team remotely close to them in Quebec. If it goes to OUA, it'll be either Windsor or Laurier — Guelph tends to crack under playoff pressure. 1 at-large wildcard berth: Mount Allison. Because who can seriously count them out? I think you are underestimating Concordia and Ottawa. Check Concordia's January schedule vs. Western's January schedule. Western is good in terms of raw talent, but they got lucky in that schedule. Concordia definitely has a rough road, but I've seen McGill and Montreal play on a national level and NO ONE can compete with them. Concordia's still slower than those two powerhouses and speed is a lot on a national platform. You are right though - Western has quite the easy road out of the gate. Their only two tough games of the above are Windsor and Toronto, and that's because they're both fighting for home ice advantage in the playoffs. Granted, and like I mentioned, the OUA is a giant conference with plenty of breathing room. Concordia has a tough ladder.